I've been helping my Dad work in the garden this summer. I love it even though it's been pretty hot outside. Those green beans and squash are going to taste good this winter.
" working across sts on Row 2 of Border". what is row 2 of border? Row 2 of Border would be your second round of stitches for the afghan edging. "Feed your fears and your faith will starve. From my distress I called upon the Lord; the Lord answered me and set me in a large place. The Lord is for me; I will not fear; what can man do to me? The Lord is for me among those who help me; therefore I shall look with satisfaction on those who hate me. It is better to take refuge in the Lord than to trust in man. It is better to take refuge in the Lord that to trust in princes. Do not be afraid of sudden fear, nor of the onslaught of the wicked when it comes; for the Lord will be your confidence, and will keep your foot from being caught. But the very hairs of your head are all numbered. Therefore do not fear; you are of more value than many sparrows. Everyone therefore who shall confess Me before men, I will also confess him before My Father who is in heaven. But whoever shall deny Me before men, I will also deny him before My Father who is in heaven. And on that day, when evening had come, He said to them, "Let us go over to the other side." And leaving the multitude, they took Him along with them, just as He was, in the boat; and other boats were with Him. And there arose a fierce gale of wind, and the waves were breaking over the boat so much that the boat was already filling up. And He Himself was in the stern, asleep on the cushion; and they awoke Him and said to Him, "Teacher, do You not care that we are perishing?" And being aroused, He rebuked the wind and said to the sea, "Hush, be still." And the wind died down and it became perfectly calm. And He said to them, "Why are you so timid? How is it that you have no faith?" And they became very much afraid and said to one another, "Who then is this, that even the wind and the sea obey Him?" Now He who prepared us for this very purpose is God, who gave to us the Spirit as a pledge. Therefore, being always of good courage, and knowing that while we were at home in the body we are absent from the Lord -- for we walk by faith, not by sight -- we are of good courage, I say, and prefer rather to be absent from the body and to be at home with the Lord. "FEEDING YOUR FAITH HELPS STARVE YOUR FEARS." and with the trumpet of God; and the dead _____ (5 words). 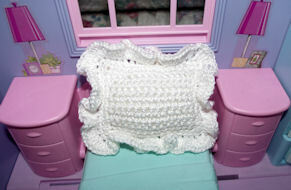 For any project that requires a foundation row of all half double crochets you can use Foundation Half Double Crochets. In other words, instead of making a series of chain stitches and then working a half double crochet into each chain you work a series of FHDC stitches. To begin a Foundation Half Double Crochet row, Chain 3.
yarn over and draw through all three loops to finish the foundation half double crochet. Yarn comes in hanks, balls, skeins, etc. If your yarn is in "hank" form, it will be necessary to wind it into a ball before you begin to crochet. With a "ball" of yarn you can work from the outside of the ball easily if you place it in a bowl or a basket to keep it from rolling away. Skeins are the easiest to manage because they have an outer yarn tail and an inner yarn tail. It's easiest to work from a skein using the inner yarn tail. Locate the outer yarn tail first. The outer yarn tail is normally tucked into one end of the skein. Pull it out and tuck it underneath a strand on the outside of the skein. Now look in the opposite end for the inner yarn tail. If you do not see it, insert a crochet hook into the main center of the skein and pull some of the yarn out so you can locate it. When I went to the Mary Maxim web site to get the thread for the "Christine's Doily" that was in the newsletter, they do not have any such product. Could you please tell me what I could use instead? Thank you very much. Any heavier weight thread would work fine. 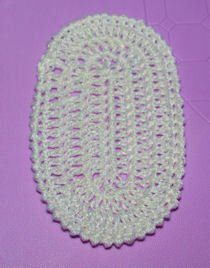 You can even use a thicker yarn if you wouldn’t mind a larger doily. 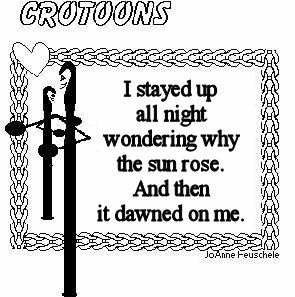 Hi l was looking for a pattern to crochet a cross to put in a frame and hang it in the bedroom. I just have a dumb question that I can't seem to find the answer to. what does that mean? if anything. just wondering, thanks! Granny Squares are worked from the center outward in rounds. Row Count Afghan Squares are worked in rows instead of rounds. 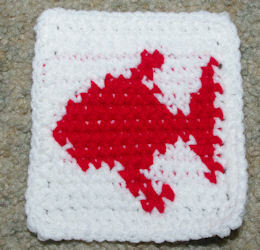 The design in the square will be formed as you crochet the indicated number of stitches of each color required. Thanks for a great question... I'm sure others wonder the same thing. Hi, can you please explain the step for your dog sweater that says in RND 22 “Hdc in each st and ch around” I’m not sure what to do here. I understand the Hdc in each st part but where do I ch around? A bit confused. So far I’m loving your pattern and I’m almost there to completing my first one. I’m a self taught beginner and have done a few easy projects. My first dog sweater. For Rnd 21 you worked a half double crochet into each half double crochet. and into each of the chains you made. Im very very new to crochet, I have found some very confusing abbreviations in simple projects. 3tr in sp before next tr ?? does the (miss 3tr) just mean 3tr, 1ch, 3tr along the sides and a normal corner?? I’ve checked as many Youtubes as I can and no one mentions miss three trebles its very confusing. 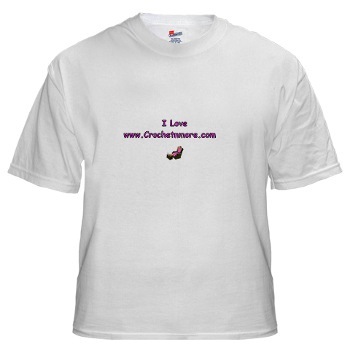 Welcome to the crochet world! says where to put those stitches directly after that. The instructions you list fail to say where to place those stitches. 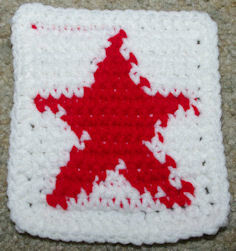 If this is a standard Granny Square pattern... you would work the instructions in the parentheses only in each corner. Then 3 treble crochets in each open space along the sides. Keep in mind that all patterns on my website are written in American terms. This can get a bit confusing as to which stitch you actually need to make. For instance, an American single crochet is called a double crochet in UK/Australian terms. the stitches will cover the slip stitches that are on the working row. hi Linda, I have tried two times to make this sweater, and have not been successful. I used a larger needle and #6 bulky yarn. The middle of the dog it is for is 19 inches around. When I chain the first forty like the pattern and measure it it is not 19 inches with a J Or H hook. I added more chains to make it 19 inches, but the whole sweater came out too big. Can you help!! You originally emailed Linda regarding the Chihuahua version of our dog sweater pattern. Our original Dog Sweater pattern is adjustable for any breed. Alternation instructions are toward the bottom of the page. your choice to make the sweater fit your dog. I am having trouble deciphering your pattern. Can't figure it out. Just started crocheting again. Any thoughts? 2. Ch2 (counts as first hdc, now and throughout); work FPdc around next 3 sts, * (hdc, ch 1, hdc) in next ch-1 sp, work FPdc around next 3 dc; repeat from * 2 times more, hdc in same sp as first hdc, sc in first hdc to form last ch-1 sp; 20 sts and 4 ch-1 sps. I get really confused with the bolded directions. I seem to do okay after the end/beginning of each round. To begin... chain 4 then join with a slip stitch in the first chain to form a ring. chain 3, work 2 double crochets into the center of the ring. that single crochet will form your last chain 1 space. When you finish you should have 12 stitches and 4 chain 1 spaces. when you finish this round you should have 20 stitches and 4 chain 1 spaces. A guy came home to his wife and said, "Guess what? I've found a great job. A 10 a.m. start, 2 p.m. finish, no overtime, no weekends and it pays $600 a week!" The biggest loser at my weight loss club was an elderly woman. "How'd you do it?" we asked. "Easy," she said. "Every night I take my teeth out at six o'clock." My family is close friends with another family who faithfully attends our church. Often we spend Sunday afternoons together relaxing at our house. Recently, when I phoned our friends, their 4-year-old daughter, Alicia, answered and politely asked who was calling. To tease her, I said kiddingly, "Alicia, you come to my house almost every Sunday and you don't know who I am?" In a reverential voice, she replied breathlessly, "Jesus?" My family has a tradition of naming the cruise control on our cars. Recently, I was traveling with my parents in their new car when we hit a wide open expanse of highway. My dad leaned back and said, "I think I'll let Tom drive for awhile." My mother translated for me, "Tom Cruise, of course." At my Marine base, the annual trip to the rifle range had been canceled for the second year in a row, but the semi-annual physical fitness test was still on as planned. One Marine mused, "Does it bother anyone else that the military doesn't seem to care how well we can shoot, but they are extremely interested in how fast we can run?" him how big to make them. While taking a routine vandalism report at an elementary school, I was interrupted by a little girl about 6 years old. Looking up and down at my uniform, she asked, 'Are you a cop? Yes,' I answered and continued writing the report. Baby Bear goes downstairs and sits in his small chair at the table, he looks into his small bowl. It is empty. "Someone's been eating my porridge!" he squeaks. Papa Bear arrives at the big table and sits in his big chair. He looks into his big bowl, and it is also empty. "Someone's been eating my porridge!!" he roars. Momma Bear pokes her head around the corner from the kitchen and yells, "for Pete's sake, how many times do we have to go through this?" "It was Momma Bear who got up first, woke everyone in the house, made the coffee, unloaded the dishwasher, went out in the cold early morning air to fetch the newspaper, set the table, put the cat out, cleaned the litter box, and filled the cat's dish... and, now that you've decided to drag yourselves downstairs, and grace Momma Bear's kitchen with your grumpy presence, listen good, cause I'm only going to say this one more time..."